The exiting conservative congresswoman won Minnesota elections because of big money she got from Texas, California and Florida. That’s the real challenge facing the GOP and American politics. Remember when Michele Bachmann announced after the 2010 election that she wanted to chair the House Republican Conference? And Republicans lined up to block her run? Remember when Michele Bachmann stepped on House Budget Committee chairman Paul Ryan’s response to the 2011 State of the Union address? And she diluted the GOP message? Remember when Michele Bachmann launched a high-profile bid for the 2012 Republican presidential nomination? And she finished in sixth place in the Iowa caucuses, with barely 5 percent of the vote and carrying no counties? Republicans who are serious about the future of their party do. That’s why there will be no mourning in the top ranks of the Grand Old Party over the decision by Bachmann that she will not seek re-election in 2014. Bachmann has been the face of what ails the GOP. And Republicans who recognize the party’s fundamental challenges may well understand this. Bachmann was a prominent figure because she figured out how to channel big donations from right-wing donors in states far from Minnesota into an electoral insurance policy. When she sought re-election after her losing presidential bid, Bachmann ran for re-election in Minnesota, raised almost $15 million and spent almost $12 million on her congressional race. Add on the fundraising and spending by her leadership PAC and she was over $16 million, with spending over $13 million. And that’s not even counting the $10.5 million she raised and mostly spent in a presidential bid that that has inspired investigations into possible misconduct by the Federal Bureau of Investigation, the Federal Election Commission, the Office of Congressional Ethics and the Iowa Senate Ethics Committee. 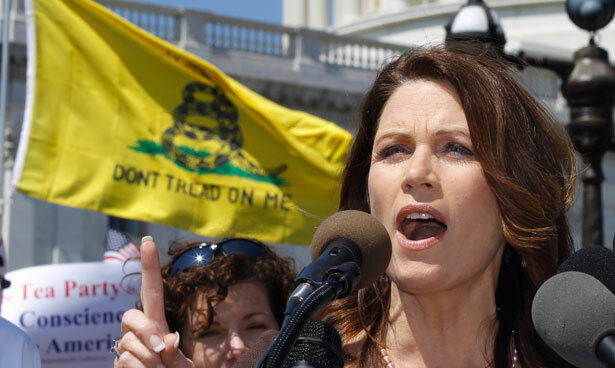 Bachmann didn’t just outspend her challenger in Minnesota, Jim Graves. She overwhelmed the Democrat-Farmer-Labor Party nominee, who raised and spent roughly $2.3 million. Yet Graves came within 4,600 votes (1.2 percent) of winning—in one of the closest contests in the country. Does anyone really think that Bachmann would have beaten Graves had the spending been evenly matched? Seriously? And does anyone think that Bachmann (who still has almost $2 million in her campaign account) could have raised tens of millions in her Minnesota district? Or even in Minnesota? We actually have the answer to those latter questions. Don’t think for a second that Bachmann’s exit will cause the donors in Texas and elsewhere to close the checkbooks that have pulled the GOP so far to the right on social and economic issues. It’s not just a Capitol Hill problem. The fact is that, while extreme and obstructionist figures may come and go, the funding sources for the politics that drags the party away from any sort of consensus building are not going away. In fact, it’s not just organized special interests and political action committees. It’s big donors who pour money into campaigns in distant states and use their immense resources to create a politics that reflects their ideology—not the values of the districts and states where they “invest” their money, and not the interests of the party they profess to be aligned with. Bob Dole is right. The Republican Party does need to “rethink” its approach. But the rethink won’t happen when political parties can be whipsawed by big donors, Super PACS and all the money pathologies of the contemporary politics. Until we discuss what progressive Republicans of a century ago referred to as “the money power,” no party will change for the better—not even a post–Michele Bachmann Republican Party. John Nichols is the author (with Robert W. McChesney) of the upcoming book Dollarocracy: How the Money and Media Election Complex Is Destroying America. Hailed by Publisher’s Weekly as “a fervent call to action for reformers,” it details how big-money politics warps our politics.